Thermage® replaces sagging and wrinkled skin with smoother, tighter skin and improved tone and texture. Your skin is made up of three distinct layers: 1) the epidermis—the visible outer surface, 2) the dermis—the collagen-rich layer beneath the surface, and 3) subcutaneous tissue—the “fat layer”; beneath the dermis that also has a web of collagen fibers. The collagen in your dermis and subcutaneous tissue is a protein that keeps your skin youthful and tight. But as you age and get more sun exposure, that collagen simply breaks down faster than your body can rebuild it, and your skin may start to sag or wrinkle. Enter Thermage. Thermage is an exciting non-invasive skin tightening treatment that reduces wrinkles and fine lines, providing you with an overall younger looking face. 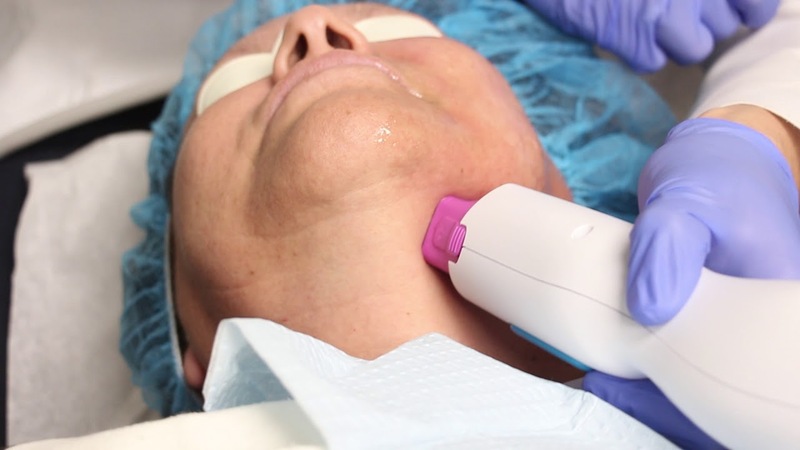 What’s more, Cosmetic Laser Dermatology is proud to offer the newest, most advanced version of Thermage that does not require pain medication and gives great results! Thermage is a painless skin tightening procedure that requires no anesthesia, and you can drive yourself home following treatment. Thermage works through a unique combination of deep heating and integrated cooling. Deep heating – The deep heating of Thermage treatment helps tighten the collagen in your dermis and subcutaneous tissue, while also stimulating the formation of new collagen. 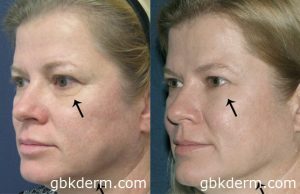 As a result, you’ll see tighter, smoother skin and improved tone and texture, starting immediately and continuing in the months following this skin tightening treatment. Integrated cooling – At the same time that Thermage treatment heats the deep layers, it also cools the epidermis, keeping the surface of your skin safe during the procedure. As a result, your skin needs no recovery time, so you can quickly resume your daily routine. Best of all, you need only one Thermage treatment to get the full benefits. 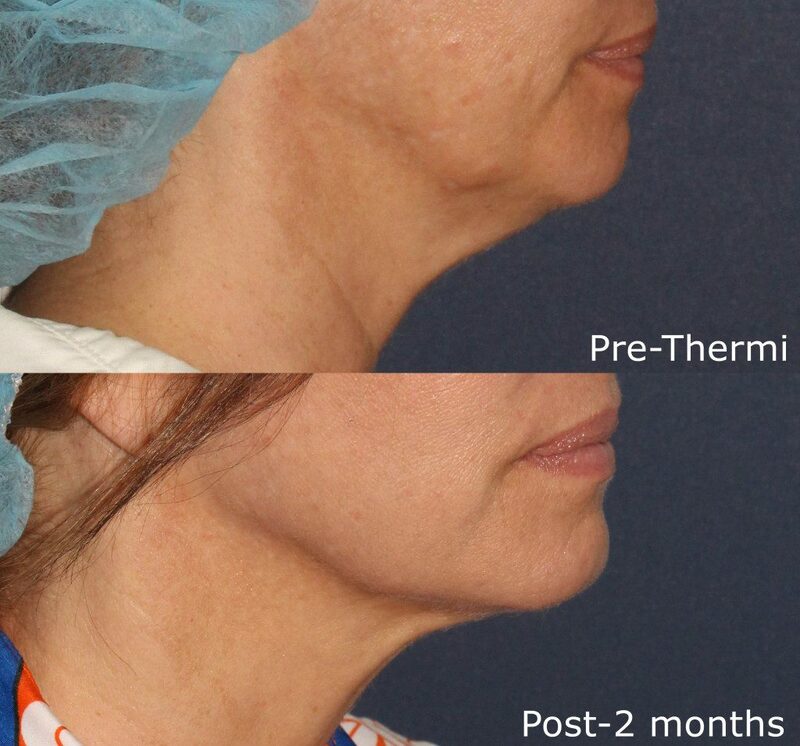 In fact, because it heats so deeply, Thermage is the only non-invasive procedure that helps contour skin in a single skin tightening and wrinkle treatment with little or no downtime. For more information on treatment for sagging skin, visit nia.nih.gov. Q: What does Thermage do? A: In response to collagen breakdown, there are many skin tightening treatments that operate by heating the inner layers of skin. But unlike laser treatments and other technologies that heat the superficial skin layers, Thermage uses unique radiofrequency (RF) technology to reach deep into the dermis and subcutaneous tissue to cause tightening in the layers that matter most. Q: Is Thermage for me? A: Thermage treatment is an easy way to turn back the clock on aging skin—on all skin colors, on and off the face. Browse the following skin conditions to see what applies to you. Then click on each treatment area to see how Thermage can help you rejoice in a younger looking you. 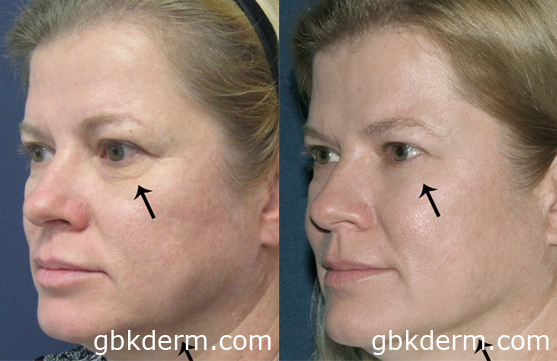 Ulthera is a great skin tightening alternative to Thermage. Similar to Thermage, Ulthera can help improve loose jowls and sagging skin of the face, neck, and chest. Contact our expert dermatologists today to learn more about your skin tightening treatment options!